yes it is an 1172 not a Sportiva as advertised. Please study the pics to determine for yourself their `make`....The registration number is displayed for reference, please note I have no paperwork with the car, this was something I was due to investigate. The whole thing has got too much now so has to go......other projects are taking up all my time. This picture is of how the body and chassis are currently, the engine, box, radiator etc are in the garage. Engine is still together as I found it as is the box. 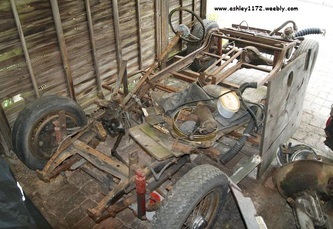 The body is removed from the chassis. I know there are no seats or passenger side glass, the frames are there but glass broke. Front screen is missing as is rear screen. There are some nice original gauges but they are broken, whether beyond repair or not you would need to ask an expert. Viewing is probably best or you`ll just have to take a gamble..... it does need a full resto as per pics. It rolls fine so can be winched/pushed onto transport. I immediately pricked up my ears on reading this and replied to him asking for more info on his other Ashley 1172 and could I include it in my website, unfortunately I didn't hear back from him again ... yet, I'm still waiting and hoping. 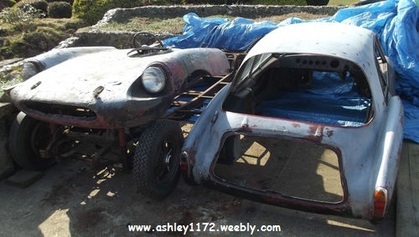 Ashley 1172 - GY 4896 on eBay did sell and I have contacted Andy, the new owner, the Ashley bodyshell was not what he wanted and it has been sold on whilst he works on with building a "Special" with the chassis, engine, wheels, etc. 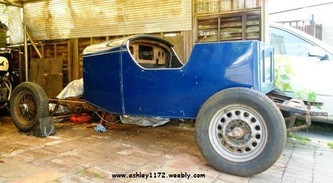 I am hoping to get some contact details with the new owner of the Ashley bodyshell as soon as Andy gets back to me with them. Well there isn't any record of this registration with the DVLA, so it looks like it has been of the roads since the late 1970's.